Diminish problem veins on the face and legs at the Neiman Dermatology Building! Want to rid yourself of unwanted veins? Designed to treat vascular lesions and leg veins, LV Vascular Lesion Treatment will address vascular lesions that are up to 3-mm in size. 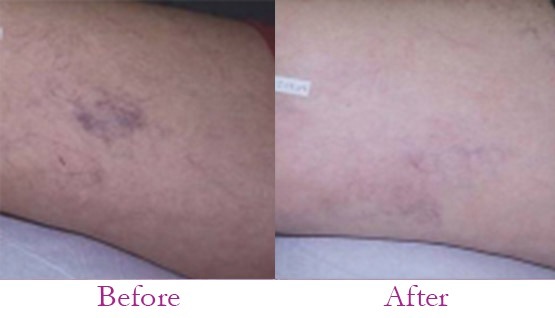 Spider veins and telangiectasia can be resolved typically in 1 -3 treatment sessions. Some more difficult veins may require more than three treatments. Compared to other laser technologies, Syneron elōs utilizes less energy and provides for more accurate targeting of veins. Built-in contact cooling protects the epidermis from unwanted damage and helps to keep the patient comfortable during the procedure. During treatment, a combination of Bi-Polar RF energy and diode laser energy is delivered to each targeted vessel. From a safety perspective, the risk of side effects is minimal. Treatment with the LV/LVA applicators will improve the appearance of unattractive leg veins (spider veins) and facial spider veins. Once treated, the veins will fade over time. A patient can continue with treatment until they are satisfied with results. Treatments are usually spaced between 6-8 weeks apart. Typical candidates for treatment are those who have adverse side effects to traditional Sclerotherapy, do not like needles or who simply prefer a more noninvasive treatment method. Large, turbulent veins are not suitable for treatment. The sensation may be described as a “hot pinch”. Patients tolerate treatment well by use of the contact cooling built into the handpieces. Discomfort usually resolves within minutes post treatment. Most patients will notice initial blanching or darkening of the vessels immediately post treatment, followed by mild bruising. This will resolve on its own. Other more rare side effects may include blistering, crusting, and pigment change to the skin. Are you looking to eliminate leg or face veins? Call our office today to schedule a complimentary LV Vascular Lesion Treatment consultation.